Ahhhh, Lent. A time of sacrifice. A time of prayer. A time of remembering to fix meatless meals every Friday. I will admit, I'm pretttty good at remembering, but not always 100%. 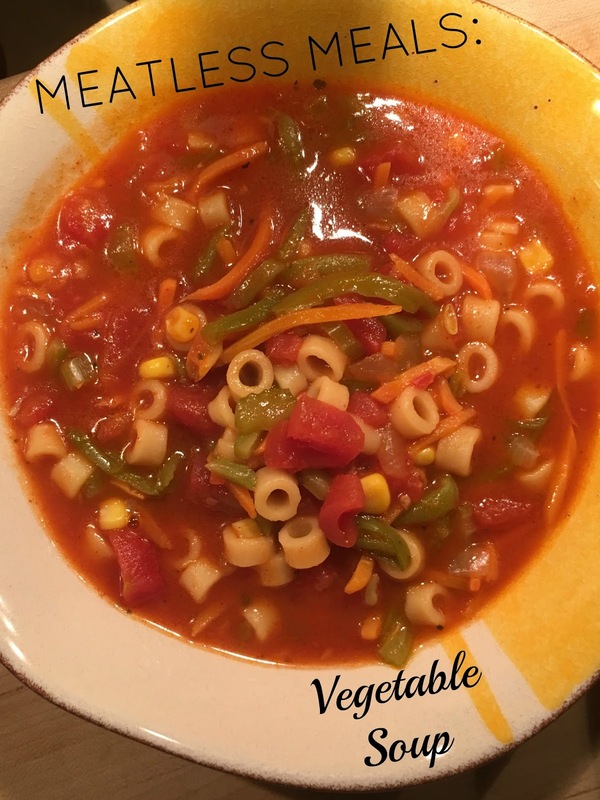 Last Friday I fixed this delicious Vegetable Soup and it got rave reviews from my whole fam...even the toddler! This recipe really is sooooo versatile. I actually based it on my favorite Pasta e Fagiole soup recipe and just omitted the beef and added green beans and corn. You can get as creative as you want with the veggies and/or beans that you add. You can even switch out diced potatoes instead of pasta. You can use canned, frozen or fresh veggies; it's absolutely customizable. This recipe is totally yummy and totally flexible, just how life should be. Enjoy! 1 1/2 C peeled and chopped carrots - I used pre-shredded carrots to save time. 1 C frozen or fresh green beans - you can also use canned beans for a time saver. 1 C frozen corn - canned corn can be substituted. Heat olive oil in a large pot over medium heat. Add onions, carrots, celery and garlic. Saute until soft. Add broth, spaghetti sauce, tomatoes, pasta and any additional seasonings desired. Bring to a boil, then add green beans and corn. Reduce heat to medium low, cover loosely and simmer until pasta is tender, about 20-30 minutes. Serve warm with croutons on top for added crunch. PS- It's even better the next day!